We are not going to catch on fire, okay. Okay. We are going to stay away from it and we will be just fine. 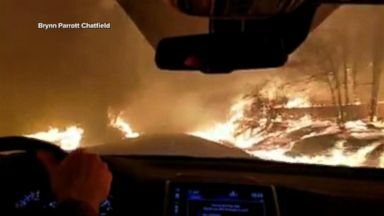 In the middle of a fiery inferno, a father bravely keeps his cool driving out of paradise, California into hell on Earth. We're going to get out, okay. We're going to leave. We're going to get fire. No, we're going to get out of here. Sirens past the flame. Look, we're past it. Out of it. Yea! The most destructive wildfire in California history. It's burning on all sides of us. Trying to get out of paradise. This is bad. Come on, people. Go! 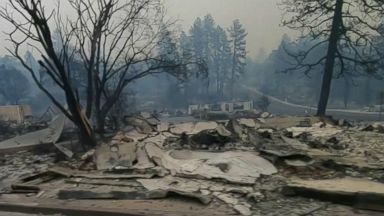 At 30% contained, the camp fire has destroyed more than 6,000 structures, burning 1,000 plus acres. 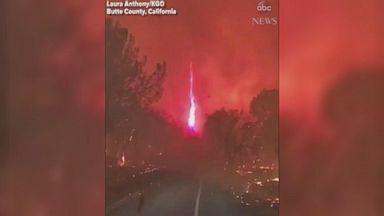 Now the deadliest wildfire in state history with at least 42 killed so far. More than 200 people remain missing. Today firefighters searching what's left of paradise. Nurse Nicole jolly said she is one of the paradise resident who is lost almost everything. I called my husband and said I don't think I'm going to make it out of this. It's coming in too fast. Putting her patients first when the fire started. We put tapes on the doors when the room was evacuated. We put tape on the door. We got the whole hospital out. Jolly beginning her own escape. The air was so hot it was burning my lungs. The back of my pants were on fire and the firefighters extinguished my ha pants and put a fire blanket over me. What was the first thing you said to your husband? I'm alive! I'm here and I love you. Brad's home miraculously surviving. He stayed through the fire with his 90-year-old blind mother. Do you think people understand how widespread the damage is? I doubt it. It's gone. Everybody I know lost everything. It's real sad. 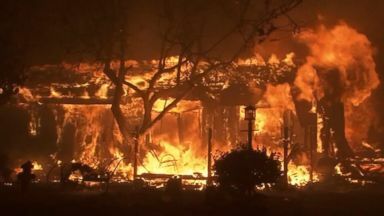 The camp fire is one of 16 active fires currently blazing across the golden state. The infernos killing more than 40 people. Forcing more than 250,000 to evacuate and turning some California communities into an ashy moon scape. Even today, firefighters near Los Angeles have a new challenge on their hands. A brush fire in Simi Valley near my colleague. We are on highway 118 in the Simi Valley. Look at the smoke. Authorities are trying to put the fire out right now. You can see the helicopter. The flair up forcing officials to shut down part of that freeway. Firefighters are still battling the woolsey fire nearby. I never have seen a fire move like that. Evacuees came back to the mobile home park where he grew up. A lot of people see these big houses in malibu and what not. I grew up in a mobile home park. We are not a bunch of rich people. Almost everybody is alive. Their home survived, but so many of the neighbors including 97-year-old Ruth cook lost everything. Everything that Ruth cook had was in this mobile home and now it's basically all destroyed. She is alone at this red cross shelter kept for her dog, Maggie. She just wants to lick. She's a good baby. Aren't you, Maggie? The volunteers are worried. They can't find a place for both Ruth and Maggie and say separating them would be devastating. You cannot separate elderly from their animals. Tens of thousands like Ruth were forced to evacuate the fire. Now 30% contained and consuming 93,000 acres. The Santa Ana winds are still a worry. The winds are here and anticipated to stay until Tuesday. This scene over the weekend in malibu. Many narrowly escaping down fire-lined streets. Emerging from the tunnel and hot embers spelling the windshield before driving to safety. Dear god, let me get out of this! Please! Please! Driving through a hell scape to get to her daughter. Oh, my god. I don't know what to do. What's going through your heart right now? Let me make it to my kids. I wanted to make sure they got safe and got to be with my family. Among the residents forced to flee, some Hollywood elites. Welcome to my home in malibu. Gerard butler's home reduced to a skeleton. Miley Cyrus tweeting about the fires. Saying my house no longer stands, but the memories shared with families and friends stands strong. 27 was on record with more than 9,000 fires burning 1.2 million acres. 2018 is shaping up to be worse with 1.3 million acres already burned. Based on where we are going with temperatures because of increasing green house gasses, we have drier and drier Summers, more and more volatile fuels. I can't see the situation getting better. If anything, it's getting worse. All across the state, stores of resilient communities coming to their neighbor's rescue. Back in malibu's point Dume, the surfer community coming into action. Fighting to save homes and bringing in supplies by boat. Shovels and hand tools are over there. Headlights and goggles and safety gear is on that table. It's melting up there. Civilian warriors working around the clock putting out hot spots and doing whatever they can. It's weird seeing it like this. A lot of memories. Trying to safety community from burning down. This community is as good as communities get. I think that when stuff like this happens. It makes people stronger. You form bonds that you normally wouldn't have. In that aspect, it's pretty cool. At the evacuation center T arrives for Ruth and Maggie. They found a home for you! For you! Special. Everybody has been working on it. What about the doggy? And the doggy, too. Definitely. We found a home for you and Maggie. A ray of hope amid a firestorm leveling everything from trailer parks to mansions to lives in a fire season that now lasts year around. 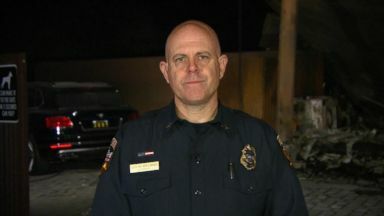 California Fire Battalion Chief Lucas Spellman shares the most updated numbers from the deadly California fires and explains what the conditions are like on the front lines.